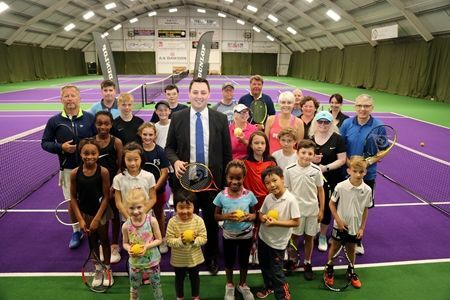 Tees Valley Mayor Ben Houchen served up a winner when he marked the start of the British Open at Wimbledon by unveiling the first phase of a £200,000 investment in Tennis World Middlesbrough this Wednesday (July 4th). The investment in new indoor and outdoor courts together with LED lighting is the first phase of what will comprise the biggest project since Teesside’s biggest independent tennis club opened in 1986. While the new courts are now in use, an impressive new function room will be complete by the autumn and the club is awaiting planning permission to build facilities that would see them be the first to bring the fast-growing sport of padel tennis to the North-East. Now owned by its members and run by a management committee, Tennis World was originally built by husband-and-wife Foster and Betty Garton in 1986 at a cost of £750,000. Now aged 90, Foster still plays at Tennis World twice a week and was a special guest at the opening of the new facilities. The club boasts a rich history of producing national and international players including several who played at Wimbledon including Commonwealth gold medallist Jocelyn Rae and bronze medallist Sarah Borwell. Situated alongside Middlesbrough Sports Village in Marton, Tennis World’s three outdoor and six indoor courts – three of which have been resurfaced - are already proving a big hit with the club’s 300 members and many visitors. Both feature state-of-the-art artificial playing surfaces resplendent in striking Wimbledon-style purple and green that Tennis World bosses believe provides “the wow-factor”. The club’s officials are confident their investment will pay dividends in not only producing more future stars but providing an increasing range of sporting opportunities to Teessiders from all backgrounds. Along with the new high-standard playing carpets, the newly installed LED lighting has also helped lift the courts up to international playing standards. “The new facilities represent a huge investment for Tennis World but they have given the club a new lease of life,” said chairperson and performance director Libby Fletcher, herself a former professional and national junior champion. “This is the most exciting time for us. We’ll always retain our family values and aim to become more inclusive than ever, but the state-of-the-art facilities really do represent a new beginning for Tennis World. After enjoying short games of tennis against Foster and some of the young children who attend the club, Houchen said: “Tennis World has been an iconic Teesside sporting facility for several decades but this investment is crucial. The club, which is sponsored by several local companies including Hunters Estate Agents, is working with Middlesbrough Council on a 25-year tennis plan designed to increase the provision of tennis across Teesside. With regulars aged from three years old to 90, the club’s new courts can be booked for members and non-members alike.